The American Society of Landscape Architects (ASLA) is excited to announce its 30 professional award recipients for 2016. Selected from 456 entries, the awards honor top public, commercial, residential, institutional, planning, communications and research projects in the U.S. and around the world. ASLA 2016 Award of Excellence, Residential Design Category. 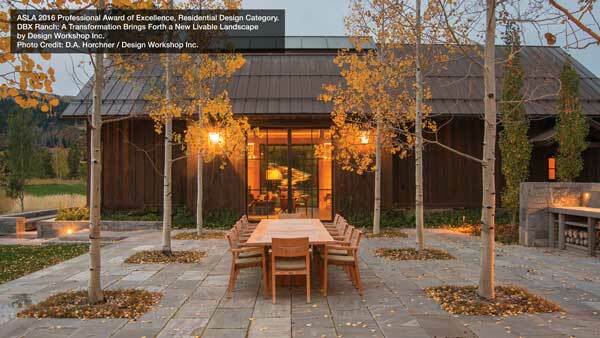 DBX Ranch: A Transformation Brings Forth a New Livable Landscape by Design Workshop Inc. Photo: D.A. Horchner / Design Workshop Inc. The winners will receive their awards at the ASLA Annual Meeting and EXPO in New Orleans on Monday, October 24 at the New Orleans Ernest M. Morial Convention Center. The September issue of Landscape Architecture Magazine (LAM) features the winning projects and is available for free viewing here. Suman Sorg, FAIA, DLR Group | Sorg, Washington, D.C. Complete awards criteria, project information and images can be viewed here: https://www.asla.org/2016awards. High-resolution images are available for journalists. Please contact Karen Grajales at images@asla.org.